There is not Derby celebration without mint juleps. 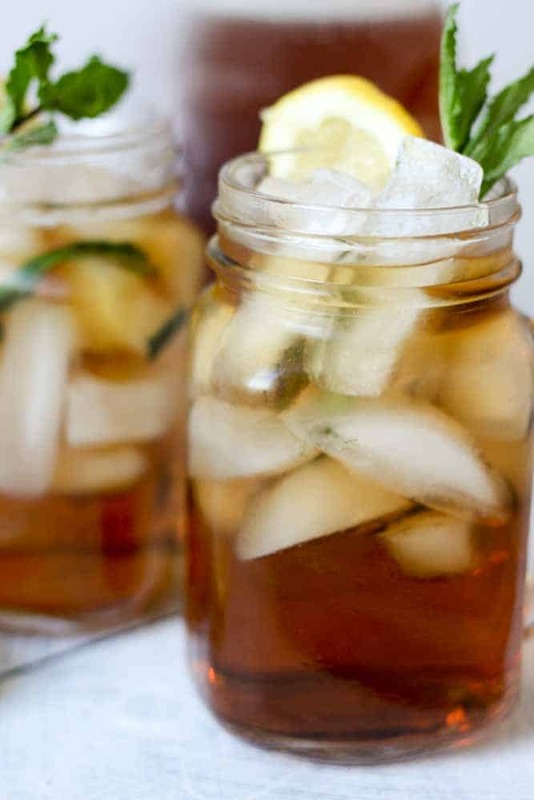 These mint juleps have a little twist to them with peach tea infused. They’re sweet and fresh and the perfect accessory to your big hat! It’s so much fun to get dressed up once in a while! Derby Day is the perfect time to do that and you get to wear such a fun hat. I was invited to two parties this year! First time ever being invited to any! Although I have a bridal shower today and won’t actually be able to attend either of them, I still feel really cool that I had the option. Not going probably saved me a significant amount of money though, because I obviously would have felt obligated to buy a new hat, then a new dress to go with the hat, then new shoes to go with the dress to go with the hat. But because I couldn’t attend I still was in the mood and wanted to get in the horse racing spirit! So I made peach tea mint juleps!! 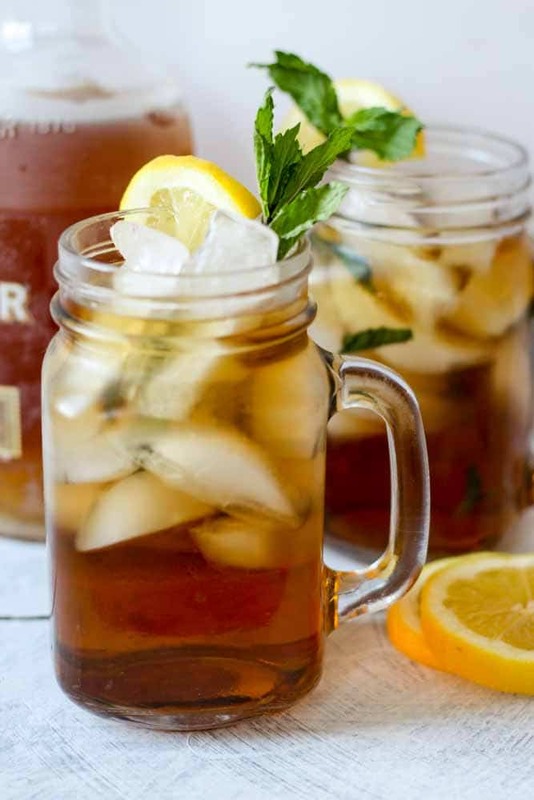 They’re your typical mint julep, just made with a peach tea simple syrup. Simple syrup made sound kinda intimidating but it’s really just sugar and water boiled together until the sugar dissolves. So to make a peach tea simple syrup, you just add peach tea to the water and sugar mixture. You can absolutely make your own peach tea using tea bags and hot water, but to save time I went with the Snapple version! I had every intention of saving my Snapple fun fact to share with all of you, but not surprise, I lost it! So I guess you’re going to have to go out and get your own?. Then make some mint juleps. 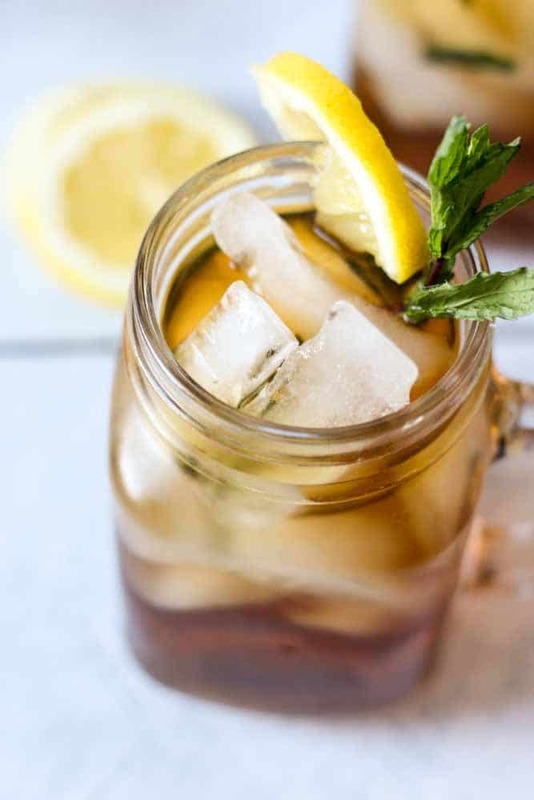 The peach and mint go so well together and what’s more southern than sweet tea? Maybe a mint julep, but that’s why I combined them! Serve this cocktail recipe with my Mini Derby Day Pecan Pies and Pimento Cheese Dip you’ll be the star of the party!! In a medium saucepan over medium-high heat, bring water, sugar, mint leaves and peach tea to a boil until sugar dissolves, about 7 minutes. Remove from heat and refrigerate to cool down until ready to serve. Add bourbon to peach tea simple syrup and mix well. 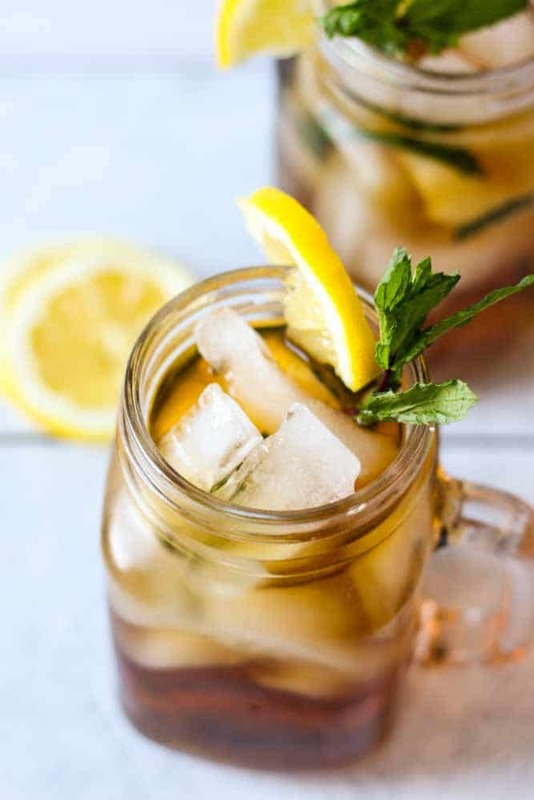 Pour into glasses over crushed ice and garnish with lemon and mint.